DataOne Networks' Remote Network Support will give you peace of mind. Stop worrying about data loss, viruses, network security, and even the day-to-day maintenance of your vital computer network. Find and fix issues before they affect your bottom line. DataOne Networks offers remote network support through its latest offering, NetworkHero, a Managed Services Platform (MSP) and a cutting-edge technology solution that will help your business network and computer systems work smarter and more securely. Our Remote Network Support is deployable in the small-to-medium sized business, as a means to conduct intelligent offsite network support. 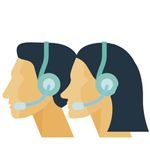 In larger enterprises, our remote support works as additional support for existing IT staff.